I like models that ‘buck the trend’ and particularly rare ones such as this Kendrick. Though various early tricycle designs followed the TWS (two-wheeled steering) principle, to my knowledge only Kendrick and Harding continued with this style on adult trikes. 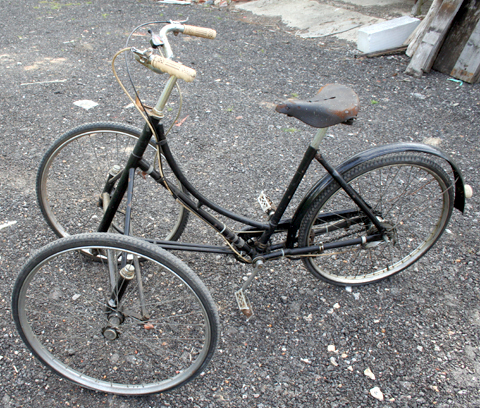 Monarch, also made in Reading, by John Warrick & Co, made a teenage girl’s trike in the 1940s with similar front-steering – CLICK HERE TO SEE IT. I’m sure that the Kendrick would have influenced its design, though the Monarch’s smaller front wheels were closer to the Harding’s style. (You can view my 1956 Hardings on another page of this website). The two front wheels and the Ackerman steering takes a bit of getting used to. It’s very different from a conventional adult tricycle with the two wheels behind. The only thing I can compare it to is a Pashley front-carrier box trike, though a box trike has a heavy front end and is a more substantial machine all round, so it feels more stable than an ordinary tricycle. I’m more used to riding commercial trikes with boxes at the front. There’s more vehicle between rider and any potential obstacle so, by comparison, I feel a bit ‘exposed’ on any adult trike. But once you’re familiar with it, the Kendrick does feel good to ride. And the two full-size front wheels of the Kendrick provide a luxury ride compared to the small front wheels of the Harding. Considering the interesting design of the Kendrick, I’m surprised that there’s not more information generally available about it. After a lot of research, I’ve at last completed my Online Museum for John Warrick & Co of Reading – PLEASE CLICK HERE to visit it. Kendrick was also manufactured in Reading, so I’ll see how much more history I can dig up on Kendrick and add it to this page. The following article is reproduced from the excellent Tricycle Association website (click here to visit it). Printed in the Association Gazette Autumn 1957. “Since 1867 the tricycle has passed through every conceivable phase of design. By 1866 the three tracked machine with steering wheel in front and driving wheels in rear began to show its superiority over other designs and within eight years this type, known generally as the “Cripper”, became almost universal with regard to wheel arrangement, although there was still a difference in method of drive, some makers using Starley’s balance gear and others the double free-wheel clutch. *NB. 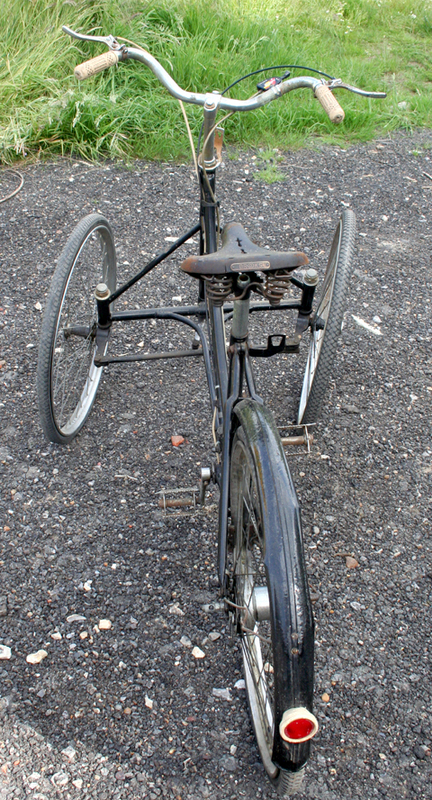 This machine was undoubtedly a Kendrick Tricycle, made by The Kendrick Cycle Co. / K.H.Wilkins, Olympia Works, Albert Road, Reading. In 1946 the proprietor was H.S.Bilbe, the inventor of the ‘Endrick’ rim. 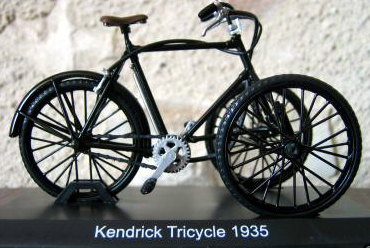 The tricycle had AcKerman steering, hence ‘Kendrick’. 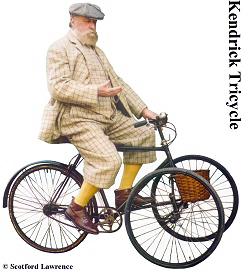 The ‘Kendrick’ tricycle formerly ridden by the late Tom Norton is in the Cycle Museum at Llandrindod Wells. 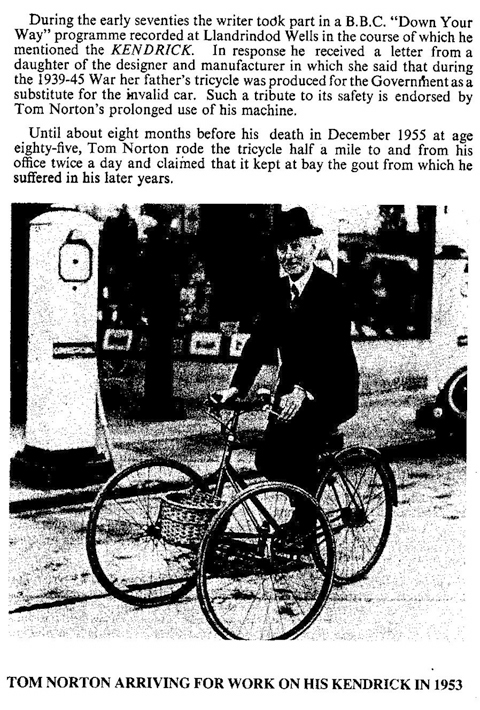 He rode the tricycle twice a day half a mile to and from his office until about eight months before his death at the age 85 in 1955. 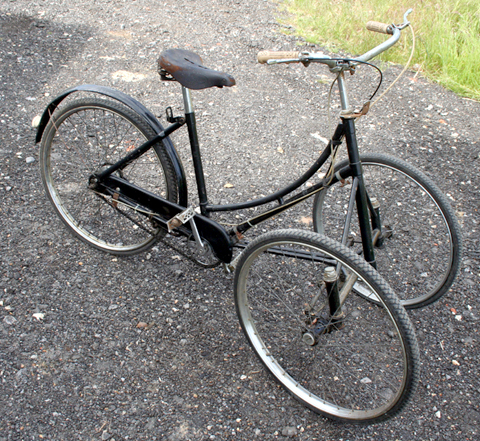 The ‘Kendrick’ tricycle was produced for the Government during the 1939-1945 War as a substitute for an invalid car. The 1951 Spring “T.A. Gazette” noted that, “H. Bruce Kingsford of Cheltenham, who at 82 still rides his Kendrick tricycle…may well be our oldest active member”. In 1953, in his 85th year, Bruce Kingsford had a ‘K’ type tricycle made for him by T. Higgins and Son Ltd. Details and pictures of this machine can be found on the Higgins page. The oddity below is a metal and plastic model of a Kendrick, measuring 7cm x 11cm. I subscribe to the ‘Reading Forum,’ where several people have posted details and discussed their motoring memories of the Reading area. In Kelly’s 1939 Directory of Berkshire, other companies specifically listed as “cycle manufacturers” rather than cycle engineers or suppliers, were Brooks of 29 Church St. Caversham, Fortescue Bros 1&2 West Street Reading ( there long after the war ), F.Gale, 1 ButterMarket (“smelly ally”) which is where I bought my first pedal car, cap bombs and marbles! Also K.H. Wilkins, 32A Albert Road (Caversham?). Has anyone heard of any cycles made by these persons/companies? 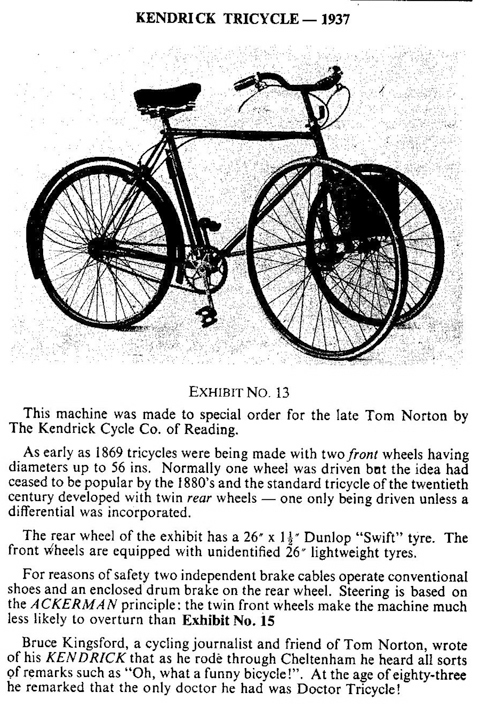 The post by 1914 warrick about the Kendrick bicycle caught my eye. The Kendrick cycle was manufactured by the Bilb’e family who lived (and still do) on the Wokingham Road, they were our next door neighbours. In the house cellar was a full workshop with lathe etc, they made a tandem which the family used and in the mid 1950’s they made a sidecar for it and used me as the “test pilot”! I remember going down London Road in it, why they didn’t use their own kids has puzzled me for a long time, perhaps I was expendable!! The bikes were a lovely maroon colour and I believe were quite expensive. I was unaware of the Wilkins connection.